An exceedingly rare modern Chinese rarity with a total mintage of only 99 pieces (and more than likely a much smaller number exists today). The lunar animal design is based on a mid eighteenth century painting of a Tibetan Mastiff by Giuseppe Castiglione from his Ten Prized Dogs series. 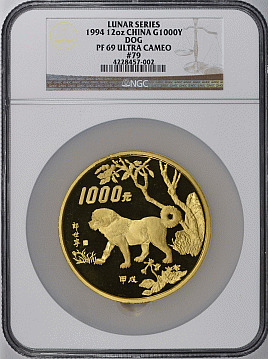 Only a scant six examples of this type have been certified by NGC and PCGS with this piece being tied with two others as the finest certified. A seldom offered rarity which has only appeared at auction a few times in the past decade.